With our trip to Greece drawing to an end, Eleni, a friend of ours, suggested we visit Xanthi to see some old houses, and a small village called Krios, to see the tobacco plantations and some mosques, since the majority of the people in this village are Muslim. We got the midday ferry to Keromoti and from there we drove to Xanthi. We were met on our arrival by Feni, Eleni's sister, and we went to a coffee shop and since it was hot (35C), we had some soft drinks. We then walked to the old city of Xanthi and saw some of the houses, which were built by some tobacco merchants. We left Thessaloniki at 9am and drove to Kavala to meet Antigoni, an award-winning Greek jewellery designer, who showed us some of her latest work. We came to know her when she was exhibiting at Jewellery Arabia in Bahrain last year. 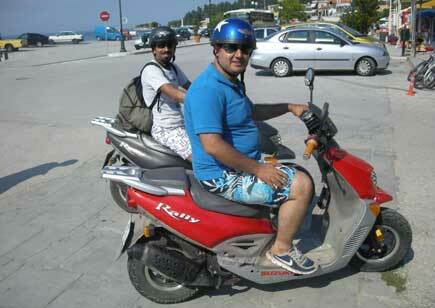 Later we drove to the port of Kavala to take the ferry to Prinos, another port in Thassos. 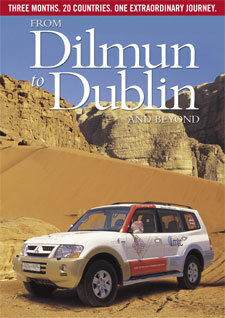 We reached around 1.15pm and drove to Mironi Hotel, our base for the next three days. We met Yiannis Batsios and his wife Eleni, who I know from my 2008 trip and who have become good friends. Yiannis is very interested in promoting Thassos and he gave us all the information that we need and told us about all the places worth seeing on the island. As promised in an earlier post, here's a virtual 360º tour of Meteora. Enjoy! We started our day by meeting Paul and Chris from Mega TV, a Greek TV channel which has been following the Friendship Arabia Expeditions. After a good conservation, we went down to the car and did two interviews, a general one with me about the trip and one with Ammar about the tour and the 360º virtual images that he specialises in. They also told us about a Greek couple who is travelling around the world (more on them at their website www.theworldoffroad.com). After we said goodbye to them, we started our drive towards Edessa and from there to Pouzar, which has waterfalls and hot springs which come from the mountain. When we were getting ready to drive to Meteora, I asked the hotel receptionist some questions about the place we were going to visit. 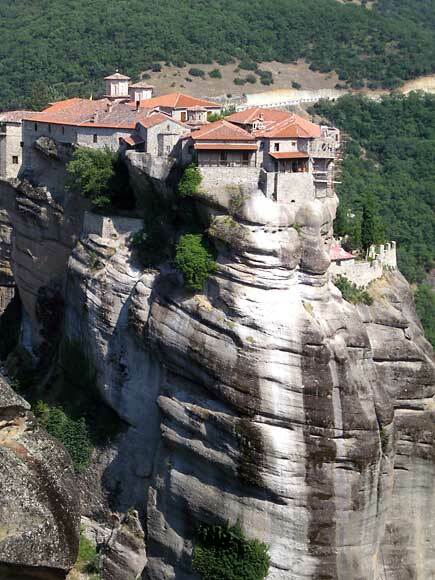 She smiled and said we'd be amazed by the architecture of Meteora and how it was built. So we were pretty excited as we started our drive at 11am. It took us three hours to get there, but the drive was certainly worth it. When we were close to Meteora, we could see the mountain and a small building on the top, but couldn't quite make out what it was at first. Once we got closer, we saw this unique an beautiful church built on top of the mountain, and it immediately reminded me of the mountaintop houses in Yemen. After a good sleep and nice breakfast, we headed out for a meeting with Dr. Angiliki Kottaridi, Director of Vergina Museum. The drive took us an hour and a half. Once we got there, she gave us a warm welcome and told us she was reading about our visit to Greece on the Culture Ministry website. She was fascinated with the idea of driving because she hate airplanes. Dr Kottaridi did a lot of work in Kuwait and is familiar with Arab customs and traditions. The meeting was good and we exchanged gifts with her and invited her to visit Bahrain. She also introduced us to Anna Tsamakda, who is restoring a terracotta head from the grave of a Macedonian Queen found in the royal acropolis. Later she gave us a tour of the museum, revealing an amazing knowledge of every single piece there. Today we woke up early – around 4:30am – and drove to the port to take the 6am ferry to Keromouti. 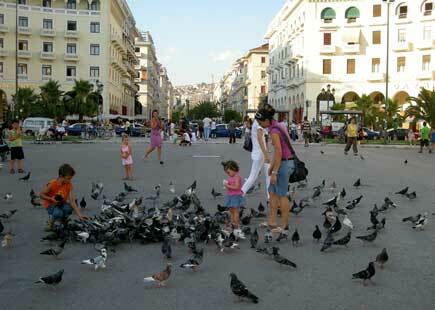 We had to drive Petra to Thessaloniki airport to take the flight to Paris, to join her family. Abbas stayed behind as he was going to take the ferry at 10am to Kavala; he is going to do an art workshop with a Greek artist in Portoheli, south of Athens. While we were in the ferry, we enjoyed the sunrise... it is an amazing feeling to see the sun rising up from the sea. Once we reached the mainland of Greece, we started our two and half drive to Thessaloniki airport. We said goodbye to Petra and thanked her for her time and her help with the tour. The Ministry of Culture and Tourism was very kind and booked us in Nepheli Hotel in the Panorama area in Thessaloniki. The hotel is excellent and the staff are very friendly. We went to the roof to have our breakfast and later went to our room to get some rest. 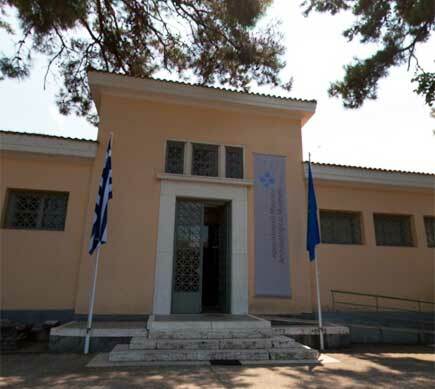 As promised in an earlier post, here's a Flash-based 360º virtual tour of Thassos Museum. Click on the image below to view it. The Flash tour allows you to "enter" or "exit" a room and look around as well... just click on the red hotspots around the entranceways and stairways. You can also click and hold on the image to move around the room, and use the mouse wheel to zoom in or out. Earlier today, Taha and I rented scooters to go around the island and explore its beaches, little towns and some hidden gems. We decided to follow the road and take a full 100km round. We were following a map that we picked up from our hotel; it indicated where all the best beaches were, and sure enough, we picked two of the best beaches (Paradise and Golden beaches) and took a dip to to cool off. What wasn't really on the map were the secluded beaches, they weren't easily accessible and were rocky yet a lot of fun and gives the sense of being in your own private beach. We stopped by one of these beaches near Aliki and had a good swim. The team today decided to split into two groups after breakfast – Ammar and Taha wanting to explore the island by bike, and the rest by car. For Abbas Almosawi, his wife Sameera and Petra, it's their first visit to the island. which means I have to be their tour guide, since I have been here twice before. Thassos is considered one of the greenest islands in Greece, even if it isn't as famous as Crete, Mykonos, Santorini, Corfu or Rhodes. It belongs to the islands of the north Aegean. 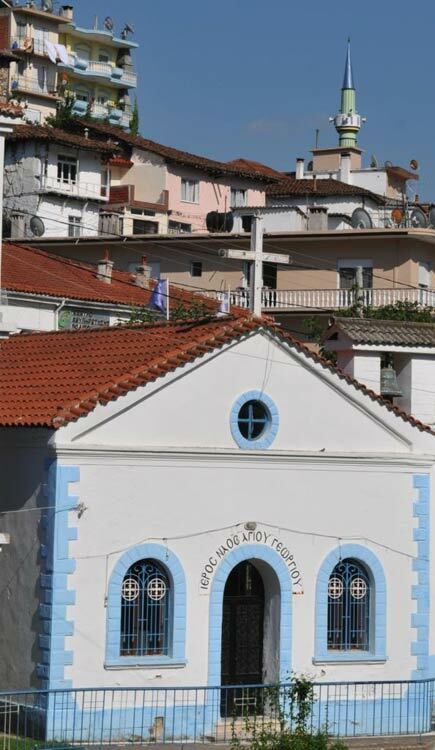 Close to Kavala, it has a green landscape, clean sea and outstanding beaches. Thassos (pop. 20,000) is 379 sq. km in area and has 95 km of coastline. Thassos was inhabited in prehistoric times (3500 - 2600 BC). 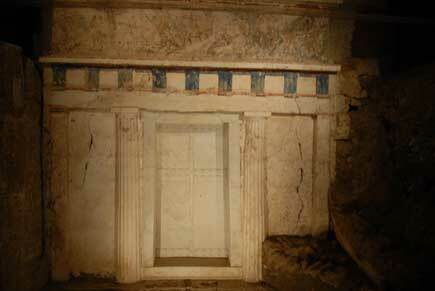 In ancient times it was known as Odonis or Idonis and was apparently settled by Thracian tribes initially. The Phoneticians arrived later and at the beginning of the 7th century BC, colonisers came from Paros. 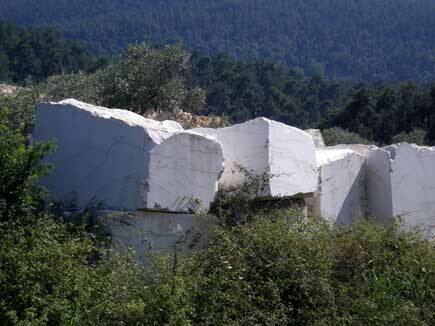 After an arduous struggle they eventually expelled the Thracians and were able to exploit the island's rich mineral resources gold and marble. Today after breakfast at the Blue Dream Palace Hotel in Limenaria, we drove to the ferry port of Thassos, where we met our friends, artist Abbas Al-Mosawi and his wife Sameera. Together we made our way to the Archaeological Museum of Thassos. The museum had been closed for renovations and this afternoon was the official re-opening ceremony. Among the guests were the Greek Minister of Culture Pavlos Geroulanos and the town's mayor. The minister welcomed the Friendship Arabia Expedition Team to Thassos and congratulated us on the journey. 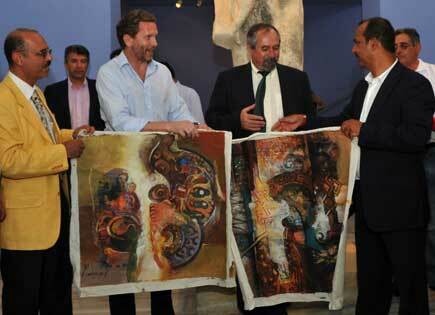 Ali exchanged gifts with the minister and museum officials and Abbas presented two of his paintings to the museum.